So long, world. I’ll see you in March. May I, for a moment, extol the glorious virtues of wintertime? My chin is finally nested in the folds of a turtleneck sweater, no longer shamed by exclamations of “Aren’t you hot?” My stoop grins, flanked by huge pots of white mums. And it is perfectly acceptable to cancel plans with the outside world and curl up underneath a blanket, nursing my inner introvert instead. Or, as I call it, my inner wintrovert. Wintroversion takes many years of faithful practice. It is a meditation, a seasonal discipline. You must wrap yourself up in the idea of home as you decamp and feather your nest. For me, this means pulling out the downy blankets and draping them over the plush chairs in my living room and at the end of my bed to keep my feet warm. Out comes the cast-iron pot, prominently perched on the stove, eagerly awaiting its marching orders: Soup! Chili! Stock! The kettle, too: Iced coffee is switched out for hot cups of tea—some destined for a mischievous dance with bourbon in hot toddies. The dog, though outfitted in a fur coat of her own, gets a sweater, if only for a season-signaling Instagram. Wintroversion, commence! During this time, I like candles. Lots of them. If my living room could even vaguely resemble the candlelit setting of a Harlequin romance novel, I would be just fine. A fireplace? Sure. I’ll wrap up in sedentary satisfaction and bask in its warm glow until my face sweats. Give me a stash of friendly, familiar books, a stack of the fall fashion issues I never got a chance to thumb through, and the comforting sound of You’ve Got Mail in the background, on its 100th loop in my living room. The most important thing you must remember, if you are going to be a proper wintrovert, is that it is a necessary state of rest. It is a time that spans the end of an old year and beginning of the new, which invites metamorphosis. Things slow down, and your body is given the grace to catch up with your life. You have time to think and reflect. Ask yourself: Have I grown? Have I outgrown? 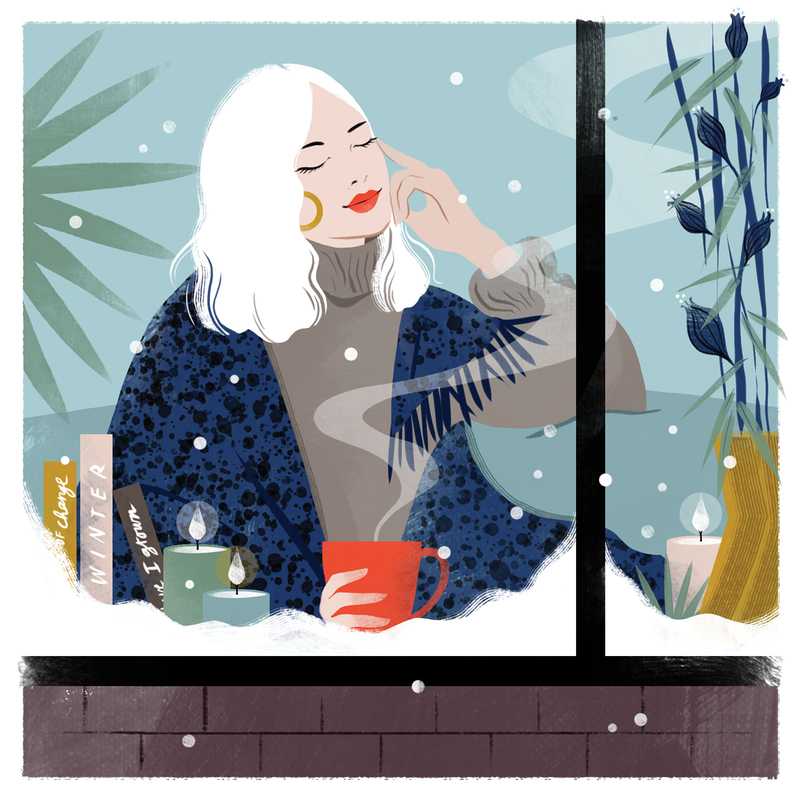 This happens to be my last winter in my current abode, a cozy two-story carriage house where I can nearly span the width between my sofa and fireplace with my arms, where guests are all but forced to snuggle. In spring, I’ll be starting fresh in my new, much more spacious house, which I must ponder. The weeks I spend cocooning in blankets are not useless sloth; it is time I need. I swaddle myself as I mentally rearchitect, making sense of the year behind me. Swapping out linen for cashmere is an act of ritual, a signal to myself that with every candle I light, every down comforter I fluff, I am ushering in a season of change. By the time spring’s first bulbs break, I am ready to shed those layers and bloom in the sun. And when my leaves fall off at the end of the year, my inner wintrovert will step in and slow me down. Out will come the blankets, and I will know she has arrived. Jess Graves is a freelance writer who has contributed to Southern Living, Town & Country, and Garden & Gun.